Red Bull doesn't get much benefit of the doubt these days, it seems. And this week we got just the latest demonstration of it, after the team made its much-anticipated decision on who is to partner Sebastian Vettel there next season. No sooner had it announced who is to fill its Mark Webber-vacated race seat for 2014 as a round of knowing and cynical nods could be sensed among many of those watching on. The Sebastian Vettel/Helmut Marko axis had prevailed again, they said. Kimi Raikkonen - for a long time the apparent front-runner for the ride - had been passed over on the grounds of being too much of a potential intra-team threat to the lauded Seb. 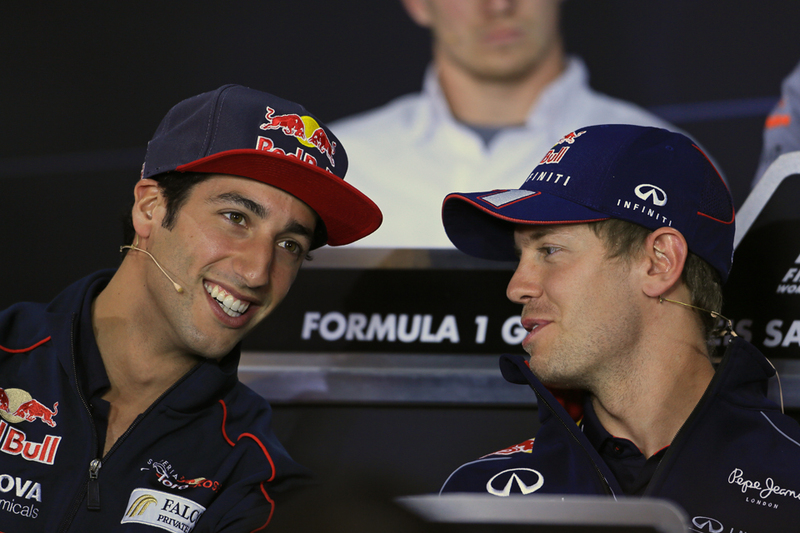 Daniel Ricciardo of the sister team Toro Rosso was being promoted instead as he is less likely to challenge Vettel's supremacy. More malleable. A rabbit for the second car. But is this fair? I as much as anyone am disappointed that we're being deprived a Seb and Kimi tete-a-tete, but is Red Bull likely effectively to write off one ride simply in order to appease Seb and Marko? Red Bull after all wants to win constructors' championships, and in constructors' championships it is the 'second' driver as it were, the points they accumulate, that is the key discriminator. And one point that I struggle with is if a Kimi move was always going to be vetoed then why pursue it for as long as and as far as Red Bull did? Seb also in Hungary talked in positive terms of being paired with Kimi (though in mitigation that was in response to a question about the prospect of being team mates with Fernando Alonso, so the lesser of two evils may have been on his mind) as well as hasn't let on in public any fussiness about whom he's to be paired with next year. Furthermore, is Ricciardo's elevation to the Red Bull race seat really a travesty? Is it possible that part of it, perhaps a major part, is that Daniel Ricciardo has made a compelling case of his own in recent times? Apologies, the sub-heading sounds slightly sinister. It's not intended to. Instead it's a reminder of what we should keep in mind but often don't: teams have access to much more information on drivers than the rest of us do looking on. This particularly applies to Red Bull on the Toro Rosso drivers such as Ricciardo, where presumably there will no limits to what the big team can find out. This will range from their attitude, ambition, work ethic, ability to learn (all of which are very good in Ricciardo's case by all accounts) all the way through to hard numbers on how much of the potential of the car the driver is extracting. 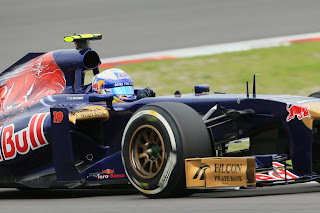 And while previous Toro Rosso pilots Jaime Alguersuari and Sebastien Buemi were dumped amid general incredulity at the end of 2011, seemingly those self same hard numbers were not all that flattering to either of them. And it was this that sealed their fates. Red Bull even in addition to what I mentioned hasn't been short of opportunities to observe Ricciardo at close quarters. He's taken part in no fewer than three young drivers' tests for the senior team, most recently in July, when the troubles with the Pirellis indirectly but conveniently afforded Ricciardo a timely opportunity to impress. He's also had plenty of goes on the team's simulator. And all the while Red Bull has shown absolutely no sense of obligation to promote from within. Scott Speed, Vitantonio Liuzzi, Christian Klien, in addition to Alguersuari and Buemi mentioned, as well as a host of drivers further down the ladder, have all been unceremoniously dumped for not coming up to scratch. Never before has Red Bull shown any willingness to give a race seat in the senior team to just anyone. It seems reasonable to infer from this that Red Bull's seen something about Ricciardo, and something very good, that the rest of us might not have done. 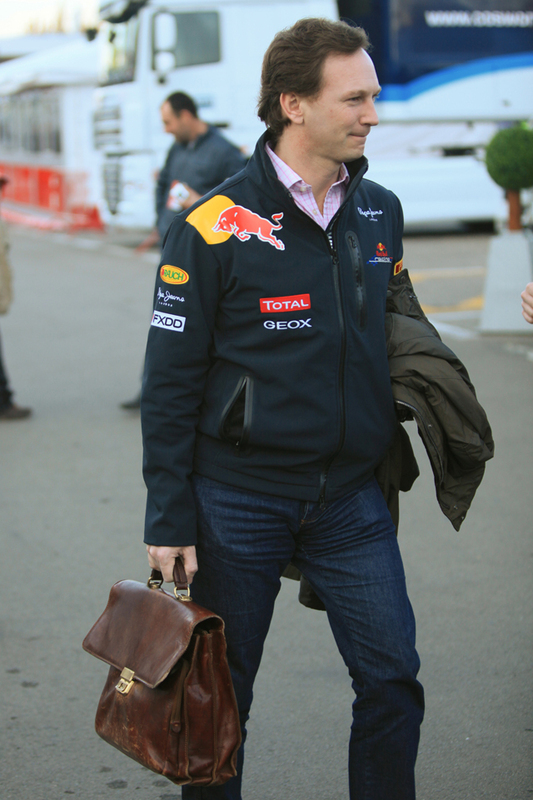 Christian Horner was asked on Sky's F1 Show if in Ricciardo (and not Raikkonen etc) he'd selected the quickest contender for the vacant seat; his answer was 'I believe we have'. But there are reasons to think he wasn't being disingenuous. 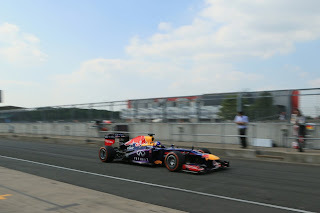 Ricciardo on raw pace looks very strong indeed. Related to the previous point, apparently Ricciardo's best time in a Red Bull from the recent young drivers' test, once fuel corrected, was pretty much bang on what Vettel managed the following day, while his long runs also left a good calling card with the team, being consistent, quick as well as gentle on the tyres (see James Allen's analysis). In F1 there is the perennial conundrum of how much a driver is bringing to the party over and above his equipment, which is particularly cryptic when further down the order. But in addition to his test form Ricciardo has by common consent been qualifying his Toro Rosso much higher than it deserves in recent months. Prior to Spa he'd got his car into the top 10 shootout in four meetings in a row. And for the most part there was no squeaking in by the skin of his teeth: in Silverstone he started P5, Nurburgring P6 and Hungaroring P8. He can also point to starting the 2012 Bahrain race in P6 in that year's recalcitrant STR7, a lap which for much of it was actually quicker than Vettel's pole time. While his team mate Jean-Eric Vergne has instead tended to move forward in races, that equally stands to reason as he tends to qualify below the car's potential. And remember that where Vergne tends to qualify he has much more flexibility on set-up and on the tyre compound to start on, as well as has more fresh tyres for the race. Whatever the case, both metaphorically and literally qualifying pace is a very good place to start from. Any F1 team would tell you in moments of candour that in terms of getting the job done the other skills required such as consistency and avoidance of error can be molded around single lap raw pace; not having the raw pace at all is much harder to rectify. And more generally, even in the age of DRS and degrading Pirellis, good grid slots and starting high can and usually does really set you up for strong results. We've seen in recent times that Webber finding himself in the mid-part of the top 10 at the end of lap one (due mainly to persistently fluffing his starts, partly down to being less good at qualifying than Vettel) is often the difference between good results and merely OK ones. This consideration probably distinguished Ricciardo's case from Vergne's too, as the latter has yet to get the knack of qualifying in the dry. Red Bull probably looked at Ricciardo as someone who on the days that Vettel takes pole can qualify on the front row alongside him, and who can keep him more than honest on pace from their opening race weekend as team mates. 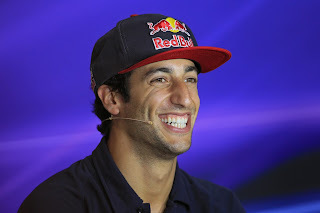 This, more than anything else, will have sold Ricciardo to Red Bull. 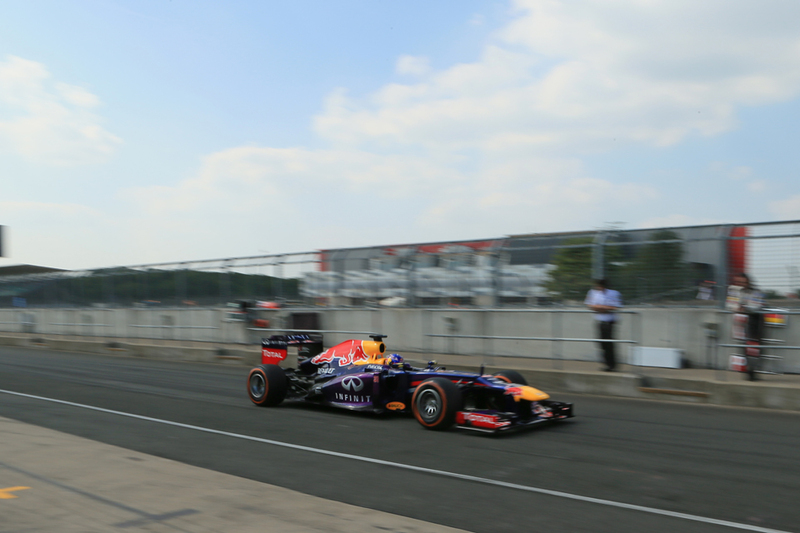 Red Bull could be looking ahead. Sebastian Vettel's contract with the team runs out at the end of 2015, and rumours of him moving on at that point, possibly to Ferrari, refuse to die. By then Raikkonen will be 36 years of age; certainly in the autumn of his career, possibly looking to retire. Red Bull therefore could be in the rather unwanted position of having to replace both of its drivers at the same time. This way the team has more of an opportunity to have a gentle transition if Vettel does move on. Ricciardo would have two years to demonstrate that he's capable either of stepping into Vettel's shoes as team leader or as being retained as a capable wing man. Over to him. Furthermore I am of the view that, both generally and in this specific case, some people get way too bogged down on this number one/number two driver point. Yes, Sebastian Vettel's status within the Red Bull team cannot be denied (and it stands to reason given what he's achieved there), but Horner isn't being giving us a bum steer when it says that Ricciardo will get 'identical opportunity and equipment' as Vettel in order to prove himself. The days of the 'number two' in F1 getting conspicuously worse or older spec equipment with markedly worse reliability and preparation than the 'number one' on a race-by-race basis are by now long in the sport's past. Certainly so in a team as well-resourced as Red Bull. Ricciardo couldn't ask for a better chance to show what he can do, and do it against the yardstick of one of the very best in Vettel. There are other factors which, while not pivotal in themselves in all probability, also would have assisted Ricciardo's cause. The financial demands of Kimi Raikkonen's management are the stuff of legend, and probably not unrelated this isn't the first time that a move for the Finn has broken down amid some mystery - his proposed move to McLaren for 2010 springs to mind. And as Edd Straw noted, Vettel apparently is on a relatively modest basic retainer (for a front-runner) but with large bonuses, but had Kimi parachuted in earning more than him he'd have been entitled to ask for a renegotiation of his own, so Red Bull by signing Kimi may have ended up taking a double hit. Red Bull isn't short of money, but as for any team finance would have been a consideration. It wouldn't have helped Kimi's cause that he maintains a notorious disdain for PR. Virtually any F1 team would consider this a drawback (although Lotus seems more willing than most to tolerate this trait), but perhaps Red Bull would especially acutely, given that without wishing to sound pejorative Red Bull is in F1 as part of its marketing activities (and as Straw also noted the company wasn't too thrilled with Kimi on this front when it sponsored him in his rallying sojourn). Daniel Ricciardo by contrast seems entirely in keeping with the Red Bull brand, and equally it's hard to see him kicking up a fuss when asked to partake in such activities. And while, as intimated, Red Bull clearly doesn't consider being a Toro Rosso driver as being deserving in itself of receiving a free pass to Red Bull, and while also I don't believe this was as crucial a consideration as some have suggested, that Ricciardo's promotion offered an opportunity for Red Bull to justify its young drivers' programme as well as the role of Toro Rosso (as well as the tens of millions it has spent on each) will not have harmed the Australian's case. In any sport, growing your own brings a certain kudos. Red Bull may not be getting the benefit of the doubt in a general sense at the moment, as I said. But in the case of who drives for the team next year I reckon that the team has made its decision primarily for the right reasons. The more you look, the more you realise that - far from being the travesty that some are suggesting - there is a compelling case to give Daniel Ricciardo the Red Bull keys.